If you don’t have a baby of your own, don’t go anywhere. This applies to you too. Because who doesn’t love to eat baby food sometimes? I’m KIDDING. But if you know someone with a baby, and want to do something nice for them, you could ask if they would like the gift of homemade baby food. Parents are always busy and anyone who offers to lend a hand is doing a public service. It takes a village, people. I have always been confused about why people who care what they feed themselves buy jarred food for their babies. Even if the label says organic happy super-healthy baby food, I can’t help but imagine that the fruits and vegetables that go into the puree are not the gorgeous specimens that would otherwise be gleaming in the produce aisle. But maybe I’m just suspicious like that. Plus, buying baby food is expensive and making it is cheap and easy. 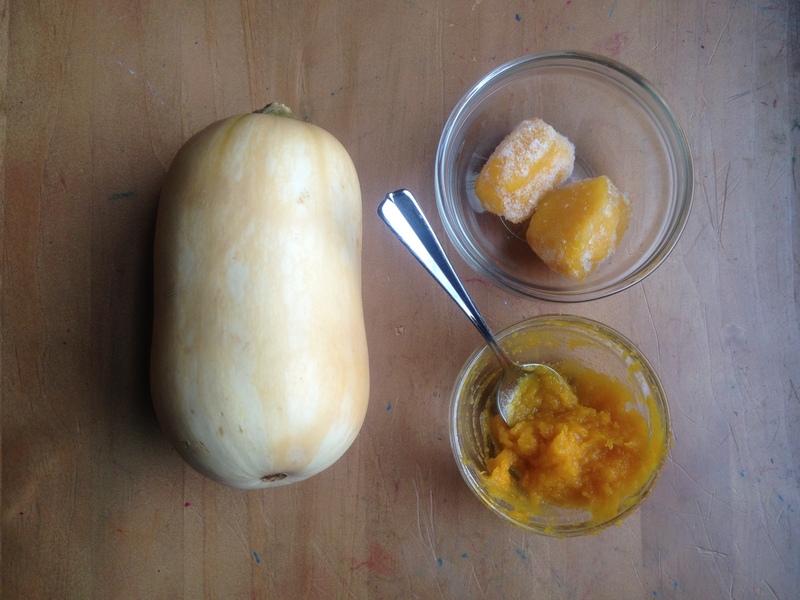 Here’s the big recipe for DIY Baby Food: peel and steam or roast an organic fruit or vegetable. Puree or mash it (older babies can eat chunkier foods). Freeze solid in ice cube trays, then pop them out into a freezer bag for storage. Some easy classics: carrots, peas, apples, pears, winter squash, peaches. Find something that’s seasonal and delicious. Babies learn to love real food through these early experiences. Today my own baby enjoyed sharing bites of tofu and egg out of my spicy bowl of pad thai, so I am thinking the days of smushed-up baby food are close to over around here. But if I can help out a friend, you can bet I’ll be making it again soon. 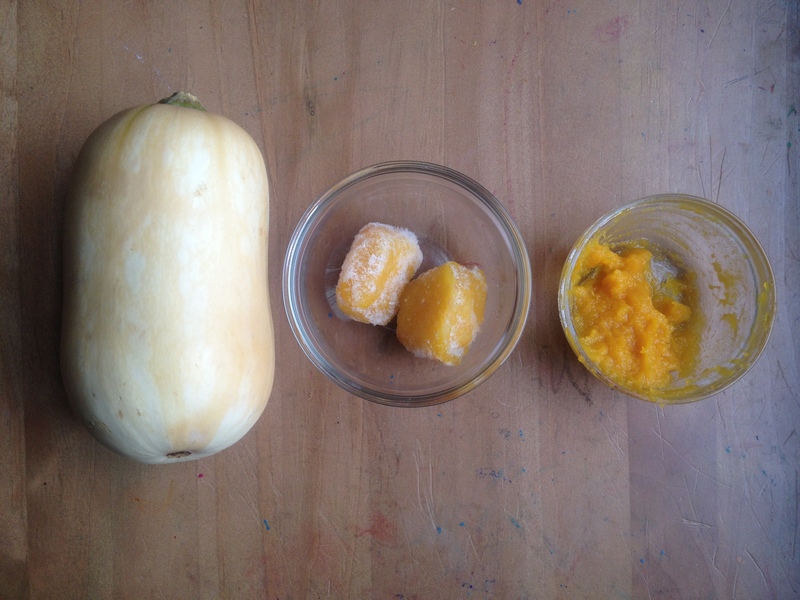 This entry was posted in DIY, Feeding Kids and tagged children, cooking, DIY, food, homemade baby food, kids, lifestyle, recipes on February 7, 2012 by emmycooks. I don’t have kids, but I have always wondered about the “convenience” and “healthfulness” of jarred foods too. But now I eat everything. My brothers had jarred baby food. And I have seen them pick shreds of green onions out of potstickers. My kids are too young for me to know if they will pick out the green onions later in life–but I hope not, for their sakes! I absolutely love this. I’m far off from having kids… but I’ll definitely keep this in mind!!! I made baby food for both of my boys. I know what they were eating and it was less expensive. They are really good veggie eaters now. (But we are vegetarians LOL). Great post! It’s so interesting how we have gotten used to this idea that babies and young children eat different food than us. What did they eat before we had so many processed options? Real food like everyone else. I agree that in general the children I have known who get homemade baby food, low sugar and minimally processed foods are willing to eat a wider variety of real food. Thank you for your post. Once you get started, it’s so easy to just puree or mash a few things until they are ready for a more solid texture.